Adobe After Effects is one of the core visual effects software products within the film/video industry. After FX CC also provides access to Cinema 4D Lite. These two software products provide you with all the high-end compositing tools needed to cretve some amazing visual effects. You can create geometric primitives and edit them at the point, edge or polygon level. You can use the Spline tools to create Bezier curves and use the Text tool to create title sequences, logos and more. You can add surface properties and textures to your models, and add lights. Then you can can bring your concepts to life and animate them! Quality Understanding of MAC / PC Operating System, preferably Mac OS X 10.11 or higher. Some experience or basic knowledge of using Photoshop and After Effects is a plus. A basic understanding of effects compositing. Additional experience with video editing software will be advantageous, but is not necessary. These are some examples of models you can create using Adobe Products. 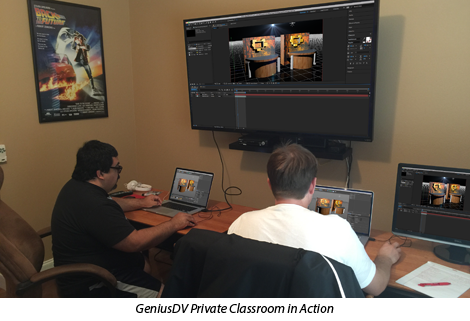 Hands-on exercise driven training for learning After FX, Mocha, and Cinema 4D. This class primarily focuses on giving you the critical skills to animate 3D objects, and understanding animation within a 3D space. In particular, the course will focus on animating 3D text and primitives with lighting controls. Emmy award winning Juan Carlos Santizo has over 24 years which brings forth his experience, technical savvy ability to help to others in the 3D compositing world. He also produced many series for TV news. This includes being awarded an Associated Press award for best light feature, and then winning an Emmy award for a visual effects driven station promo spot for MegaTV. Check out Juan’s demo reel below! Interface Overview : Learn how to customize the After Effects interface. Discover how to change the layout of the main windows and configure critical tools so they match your current workflow. Adobe Cloud Features: Learn about amazing new features within the Adobe Cloud. This includes learning about applications such as Adobe Capture that are designed to work with your phone or tablet. These applications are designed to integrate directly with After Effects which will save you countless hours of work. Creating Compositions: Master several straightforward approaches of working with 2D and 3D elements in After Effects. 3D Objects: Learn how to manipulate 3D objects to represent certain After Effects properties over time. Key concepts include learning how to use motion paths and velocity with special keyframe assistants such as ‘easy ease’ and ‘time reverse’ keyframes. Integration with Adobe Premiere: Learn how Illustrator, Photoshop, Mocha, integrate within After Effects. Transformations: Take your animated AE elements and integrate important properties such as scale, rotation and opacity changes. Learn how to change the anchor point around which transformations occur. Splines and Curves: Learn how to manipulate bezier curves to create customized splines for your animations by using the keyframe graph editor. 3D World (ball) Animation Projects: Use After effects to create your own animated 3D world! After Effects Tiitles: Learn how to use one of the most advanced title generators in the industry. You’ll learn about the controls for creating amazing titles within After Effects. Photoshop Styles: Explore how Photoshop styles can be used to enhance your titles within After Effects. Lower Third Titles: Learn how to create amazing lower third graphics in Photoshop and then use those assets directly within After Effects. Then learn how to animate the connected assetts to create a template that can be used directly within Adobe Premiere anytime. Using Backgrounds: Learn how to use backgrounds to create amazing composites by using solids, blending modes, and effects. Stencils and the ‘T’: Explore how to use stencils and silhouettes which affect the transparency of layers with an After FX composite. We will also show you the difference between transparency, and ‘alpha add’ transfer modes. Creating Solids and Shapes: Learn about the differences and strengths between solids and shapes. Learn how to use shape templates for creating masks. Masks: Learn how to use masks to create mattes, stencils and silhouettes. Tracking in After Effects: Explore creative concepts by using the After Effects tracking engine. Learn how to utilize single point trackers, four point trackers, and 3D tracking. Take a quick overview of rotoscoping. Using Mocha within After Effects: Learn the critical fundamentals of using Mocha as your primary tracking engine. Keylight and Chroma Key Points: Master the use of keylight for creating amazing chroma key effects. 3D Space within After Effects: Learn about using a 3D virtual camera inside of After Effects. Then learn how to use lights, parallax, depth of field, parenting, and various ways of controlling your virtual camera with AE. 3D Tracking: Learn how to perform tracking within 3D space. Explore amazing methods of using 3D Chroma Key tracking. Raytracing: Explore the critical components of using the After Effects raytracing engine. Cinema 4D Lite: Explore the use of ‘Cineware’ to create 3D elements that dynamically communicate with After Effects. Cinema 4D Titles: Create 3D extruded text, apply color and textures. Learn how to apply deformations to text objects. Then we’ll walk you through applying lights to create an amazing animated composite. Multipass Rendering: Understand why multi-pass rendering is important for complex composites. Timewarp and Time Re-Mapping: Learn how to manipulate time through powerful plugins. Master the use of optical flow. Adding Camera Effects to Live Video: Learn how to use motion blur, camera shake or ‘Bokeh’ for video elements. Color Grading: Overview of using ‘Lumetri’ directly within Adobe After Effects, including how to use ‘Color Finsee’ and other color correction options. Rendering: Learn specific rendering techniques related to other NLE’s using After Effects built in render engine. Learn how to use Adobe Media Encoder. Review various video formats and codecs related output. Final Project: Create a show opening for newcast or advertisement using all the tools you’ve covered. Classroom Training in Orlando, FL. Our organized AE Cinema 4D class is a great choice for individuals interested in 3D animation design. Whether you’re a seasoned video compositor or just starting out, our classes average only 4 students, so your instructor will be able to keep you challenged with highly personalized attention.